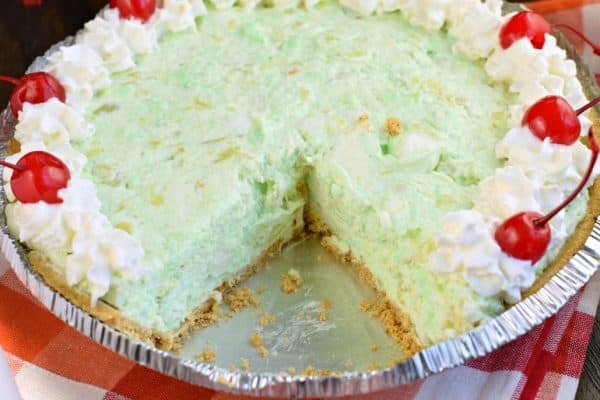 Deliciously easy No Bake Pistachio Pie recipe is filled with cream cheese, pineapple, and marshmallows in a graham cracker crust! 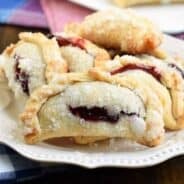 You’ll love this sweet treat at your next potluck or holiday party. When it comes to holidays, I like to make desserts as simple as possible. Who needs the stress of a complicated treat? Today’s Pistachio Pie recipe is a favorite of mine. Whether you’re serving it for a weeknight dessert or a holiday like St. Patrick’s Day or Easter, this is wonderful. Do you remember watching Mr. Food on television growing up? Staying home sick from school I would see him on TV mid-day with a little cooking special. Anyway, this pie is inspired from his show! And from my favorite Pistachio Fluff salad. 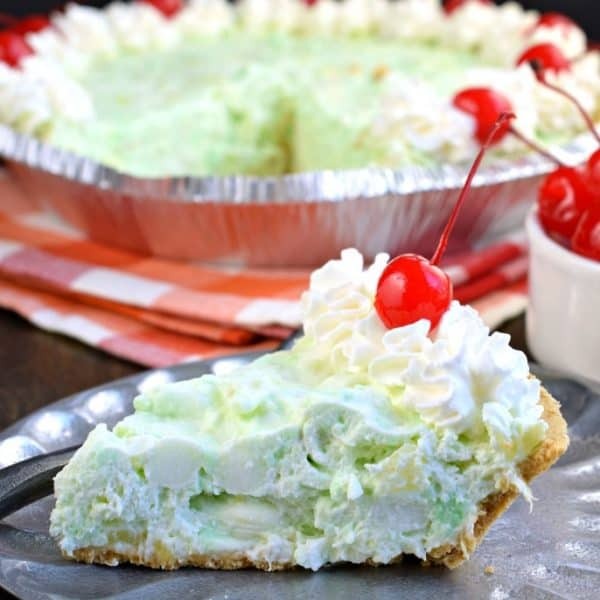 As a fan of pistachio pudding, this fluffy, creamy pie has everything I crave…plus it’s a no bake dessert! This recipe will make TWO pies. Perfect for holidays and sharing with others, or you can freeze one for later! Start by making two graham cracker crusts, or do what I did and purchase them already made. Normally I would make my own using THIS recipe, however, with holiday chaos I chose to purchase the already made crusts. If making your own, pulse 18 full size graham crackers with 1/2 cup granulated sugar in a food processor until fine crumbs. Add melted butter and stir with a fork. Press crumbs into the bottom of two pie plates, using the back of your hand or bottom of a cup to press firmly. Set aside. For the filling, I used homemade whipped cream instead of Cool Whip. I have nothing against using Whipped Topping, but I forgot to buy it when I was setting out to make this recipe for the blog. Plus, so many of you ask me anyway if you can use homemade whipped cream. In a large mixing bowl, beat heavy whipping cream until stiff peaks form. This will take several minutes. Set aside. In mixing bowl, combine softened cream cheese with pistachio pudding mix. Beat until light and fluffy. Add in crushed pineapples. Do not drain. Mix until combined. Fold in marshmallow and homemade whipped cream until blended. Spoon into pie crust and chill for several hours or overnight. When ready to serve, top with a dollop of whipped cream and a cherry. You can even add chopped pistachios if you’d like. Keep refrigerated until ready to use, store covered. 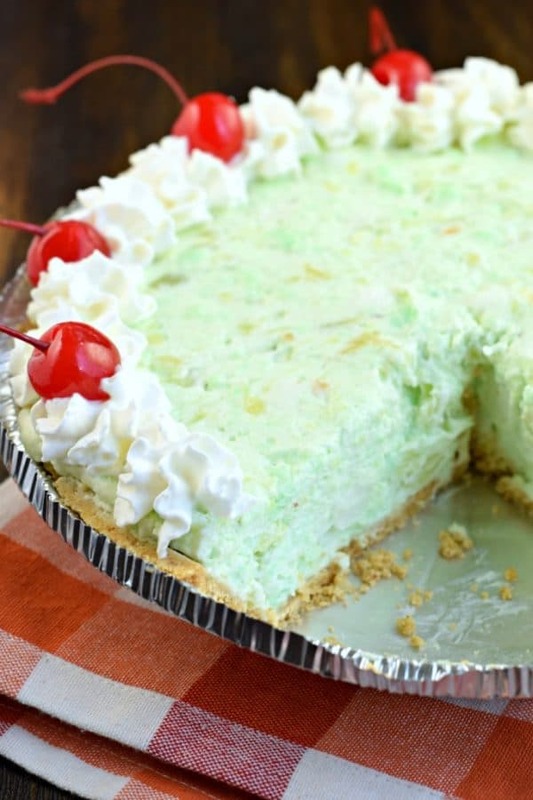 Can you freeze Pistachio Pudding Pie? Once you’ve made the pistachio cream pie filling, cover the top of the pie with plastic wrap. Then wrap the entire pie with foil. Can be frozen for several months. When ready to serve, refrigerate overnight. 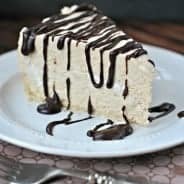 Top with whipped cream and enjoy! 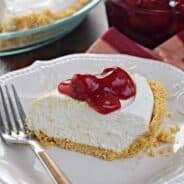 You can also serve this pie FROZEN for a different texture. It’s fantastic and will remind you of my favorite Cranberry Orange Salad recipe that we serve during the holidays! Well of course you can substitute other puddings in this recipe to create a whole new flavor. You can also swap out the homemade whipped cream for Cool Whip. Add in some coconut to the pudding mixture create an Ambrosia recipe. When I think of watergate or pistachio desserts, I always choose this Watergate cake as my go-to “feed a family” recipe. It’s insanely delicious and I am always asked for the recipe! This Watergate Sheet Cake is nutty and moist thanks to pistachio pudding and pecans. Topped with a sweet, light whipped cream topping and coconut, this cake has it ALL, and it’s easy to make too! You’re going to LOVE these Watergate Cupcakes! Extremely nutty and moist thanks to pistachio pudding and pecans. Topped with a sweet, light whipped frosting, which is perfect for summer! 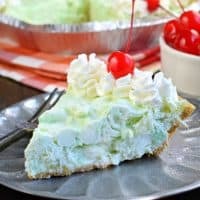 Deliciously easy No Bake Pistachio Pie recipe is filled with cream cheese, pineapple, and marshmallows in a graham cracker crust! You'll love this sweet treat at your next potluck or holiday party. When ready to serve, make homemade sweetened whipped cream by beating 1/2 cup heavy cream in mixing bowl until stiff peaks form. Beat in powdered sugar. Pipe onto pie or spread thin layer over top. Add some cherries. You can even add chopped pistachios if you'd like. I love making no bake desserts especially during the heat of the summer. This one definitely moves to the top of the list. 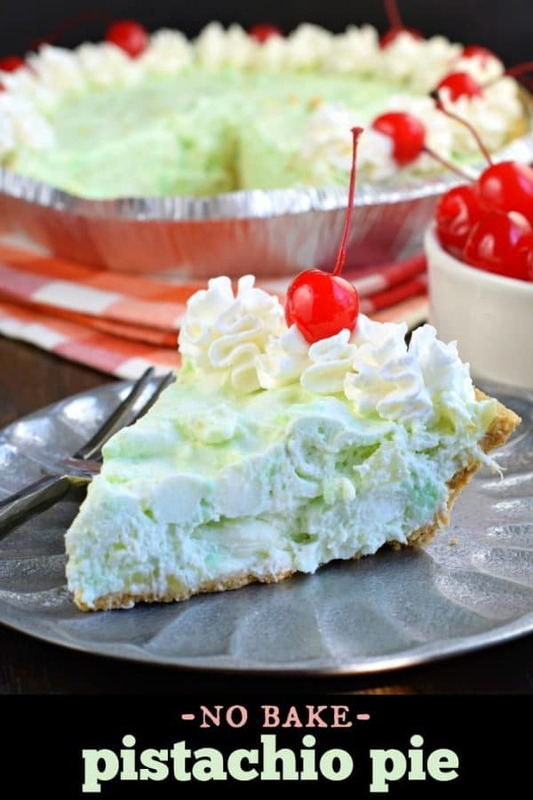 Pistachio is my weakness, this pie is out of this world! 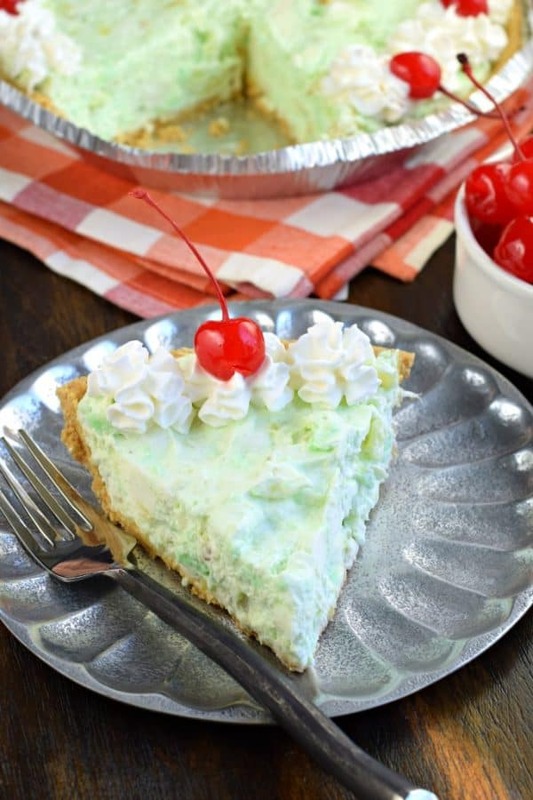 Ice cream in pie form…. a total winner! I would love a slice of this gorgeous pie!! YUM!! This pie is what dreams are made of! I love anything pistachio. I have tried the pistachio cake and it is delicious, love it! Can’t wait to try the pie!! One of my fav pies. Can’t wait to ask my mom to make me one. The recipe is delicious and looks so good.